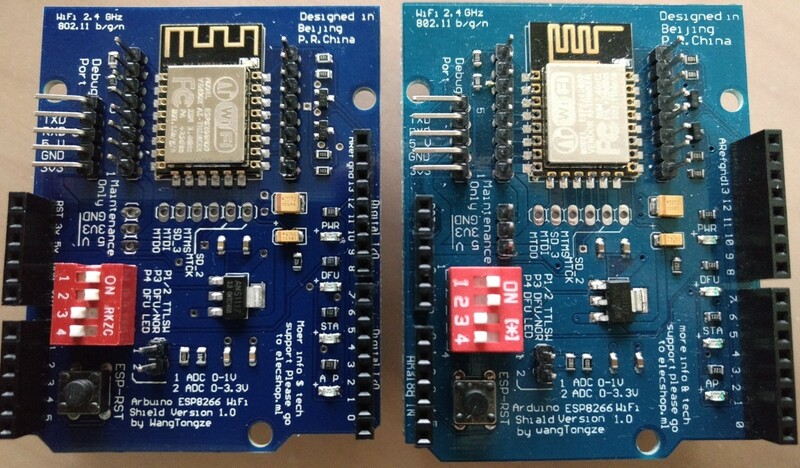 After I dug more into the ESP8266 WiFi shield, I got curios, why the experiences were so different between various users. All in all, I’d highly recommend NOT to buy any of those shields. Their design seems to be flawed. If you still want to buy it anyway, I’d recommend the „shield“ variant. Even if it behaves more stupid than the „shiald“, it seems to provide more stable WiFi. Just bend pins 0 and 1 when attaching it to the Arduino and do the wiring manually as described in my other article. In case your project is flexible enough and you need WiFi: Just use the something like a NodeMCU instead of the Arduino. You can still program it using the Arudino IDE, but it has the WiFi build in and way cheaper than the shield (or even the Arduino). I have also seen a Version 0.9 of this shield in some shops, but I am not willing to invest more time and money in crappy hardware for scientific reasons 😉 . If someone has some experience with it, I’d be happy to read about it in the comments. I was actually getting better page loads in the super sensitive location, though I am wondering if it might be power related again since I had to turn up the power on my nRF24 for it to work reliably further away from the other nRF module… In any case I think I’m done messing with this thing as it’s working the way I need it to… It’s worth the whole $6 I paid for it…. The connection between the ESP and PIN0/1 should be visible on the bottom. It’s hard to see, but at least with my shields, it’s there.